That helped propel Apple to become the world’s first company with a market capitalisation above $ 1tn (£768bn). 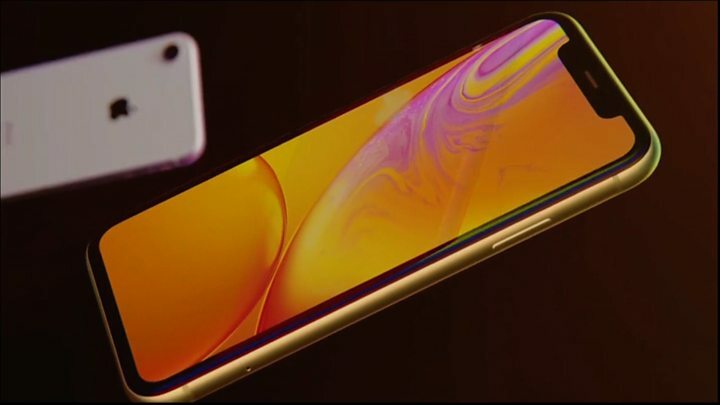 The XS Max will become the most expensive handset Apple has sold to date, with its price ranging from £1,099 to £1,449 depending on its amount of storage. The XS will match the original X’s £999-£1,349 cost, while the XR will be £749-£899. Apple has not, however, included a headphone dongle this time round, so owners of wired headphones will need to factor in an additional £9 charge to add one. In addition, its chassis is made from aluminium rather than steel, which means it is likely to be less damage-resistant. However, unlike the more expensive models it comes in six different colours. The latest phones feature a fresh processor – the A12 Bionic. It is the firm’s first to feature seven nanometre transistor technology, which should aid energy efficiency and computation speeds. Its inclusion means the iPhone XS will last about 30 minutes longer on a battery charge than the X, Apple suggested. 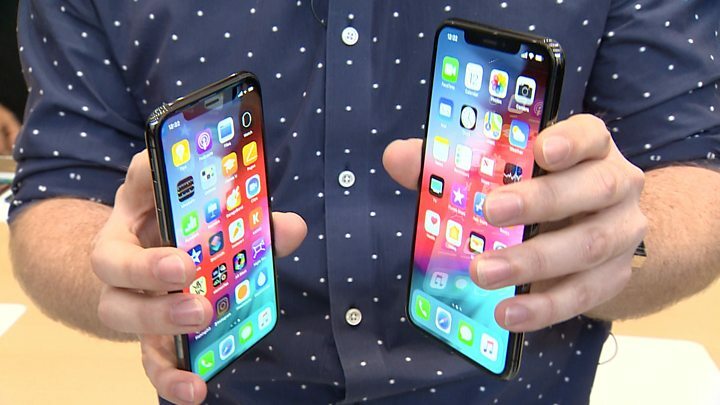 The firm also said that its Face ID system would now work faster than before and it demoed several apps, showing off its augmented reality prowess. A12 Bionic, and the new Neural engine in particular, will enable developer to do all sorts of interesting new software. Will be interesting to see a whole host of new software experiences with rich machine learning built in. The XS and XS Max also introduce support for two mobile contracts – in most countries this will be via a physical Sim card in addition to an electronic eSim, which can be activated via a QR code among other means. The version sold to Chinese consumers, however, will require two physical Sim cards to achieve this. 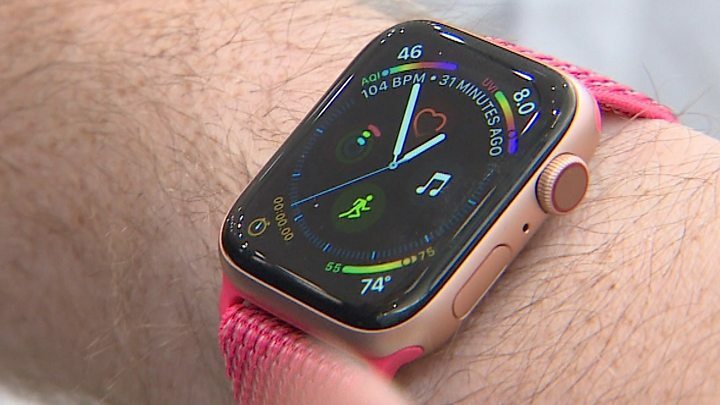 Earlier at its California event, Apple unveiled a new smartwatch with a display that extends further towards its edges than earlier models. This allows more information and shortcuts to be shown at once. It can also display electrocardiogram heart waveforms for the first time. This works via new sensors in its back and crown to allow owners to check if their heart has an irregular rhythm. In addition, the timepiece will automatically warn its user if it detects their heart is beating abnormally fast or slow during everyday use. Apple said the app that provides these functions had been given “De Novo” clearance by the Food and Drug Administration – meaning that it is recognised as being an entirely new category of product that can legally be marketed in the US as being capable of providing health readings safely and efficiently. However, the paperwork makes clear it should not be used as a replacement for traditional diagnostic equipment. The Apple Watch’s EKG may be a very useful tool, and FDA clearance is a important (and necessary) step, but it does have limitations and FDA's comments make it clear that it is not a substitute for getting checked by and advice from an actual doctor if you suspect a problem. “Getting FDA classification for health features on the new Watch underlines Apple’s leadership in wrist-worn tech,” commented Mr Wood. A new fall-detection facility also debuts thanks to the introduction of “next-generation” gyroscope and accelerometer sensors, which Apple said sampled data eight times faster than before. If the associated software believes the user has suffered a hard fall and remained immobile for a minute or more, it will send the emergency services an alert including the user’s location, as well as contacting chosen friends or family if set to do so. The cellular 40mm version of the Watch Series 4 begins at £499 and the 44mm at £529. That marks an increase on the 38mm and 42mm Series 3 equivalents, which respectively cost £359 and £429. Apple also confirmed that the next version of its mobile operating system – iOS 12 – will be released for existing devices on 17 September. Apple has never told us how many Apple Watches it has sold since the first device was released in 2015, other than to say it’s the top-selling device in its category. Analysts, though, think sales are in the region of 50 million. Minuscule compared to the iPhone, but this is a device that’s clearly on the up. It began life as a fitness device, but this update will, and this isn’t marketing puff, help people stay alive. Fall detection, and the ability to conduct an ECG to measure heart health, are both major new features that the healthcare industry is tremendously excited about. I haven’t had a chance to try it yet, and one concern for me would be false positives – it thinking I’ve fallen over when I’m perfectly fine. And, if this is going to be marketed at elderly consumers, Apple’s boast of packing the interface with more “complications” will make it, well, more complicated. But make no mistake. With US regulator approval – the first device of its kind to be given that clearance – insurance companies will be ordering these by the bucketload. The world is aging, and access to health is getting more expensive. It’s not often a Silicon Valley company creates a product with the over-60s firmly in mind. Apple making a big leap into this market will make the Apple Watch, not the iPhone, the talking point of Apple’s year.